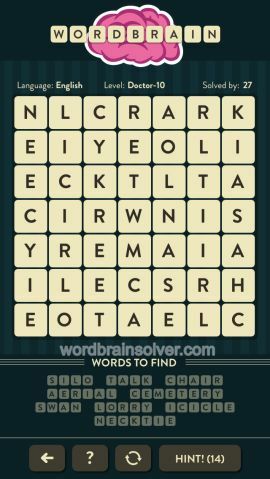 Wordbrain Doctor Level 10 Answers and Solutions. My puzzle is different. The top line is ENLCELL. I have 3 K,s and LORRY is not a correct answer. Help!! My Doctor level 10 has clock and no lorry. Couldn’t get words in the right order to work so ended up leaving clock till the very last word and passed level. Hope this helps anyone with the same. My letters in doctor 10 do not work with these words. I can’t get necktie.. letters are enlcell in top row! !